In 2007, a team of international security experts and researchers at the Henry L. Stimson Center launched an initiative to build an effective model for sustainable nonproliferation of biological, chemical, and nuclear weapons. The project represented an exciting and innovative way of thinking about security: a "dual-use" approach that operated at the nexus of the security and development communities. The team's ingenuity paid off. After less than six years, the Stimson Center is phasing out its involvement in the successful program, which will now be government funded. 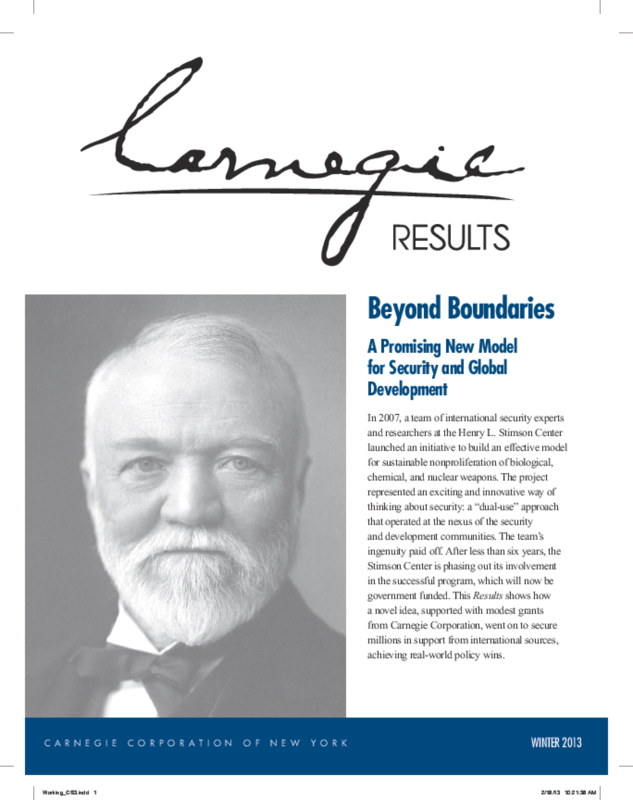 This paper shows how a novel idea, supported with modest grants from Carnegie Corporation, went on to secure millions in support from international sources, achieving real-world policy wins. 2012 Carnegie Corporation of New York. All rights in photographs, illustrations, artworks and other graphic materials are reserved to Carnegie Corporation of New York and/or the copyright holders (licensors).